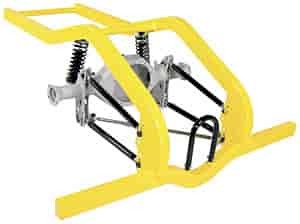 Competition Engineering 4-Link Rear Frame Rails & Kits will save you hours of fabrication time. Each kit is welded on precise jigs for unmatched accuracy; 28" kits are available unwelded. This allows the chassis builder to cut to their desired width. Magnum Series kits are designed for ultra-high horsepower race cars. They have 1/4" thick brackets with 5/8" mounting holes on a 21" radius and mounting holes for Wheel-E-Bars. The link bars are 1-1/4" OD on top and 1-3/8" OD on the bottom and come with either 3-way or 12-way adjustable shocks and springs. Get hooked up to win right out of the box! There should be no problems using this on the Malibu.